Shrove Tuesday is traditionally yet another celebration for those suffering from coeliac disease or a gluten intolerance. It doesn’t have to be anymore, with the range of ingredients available increasing by the day. 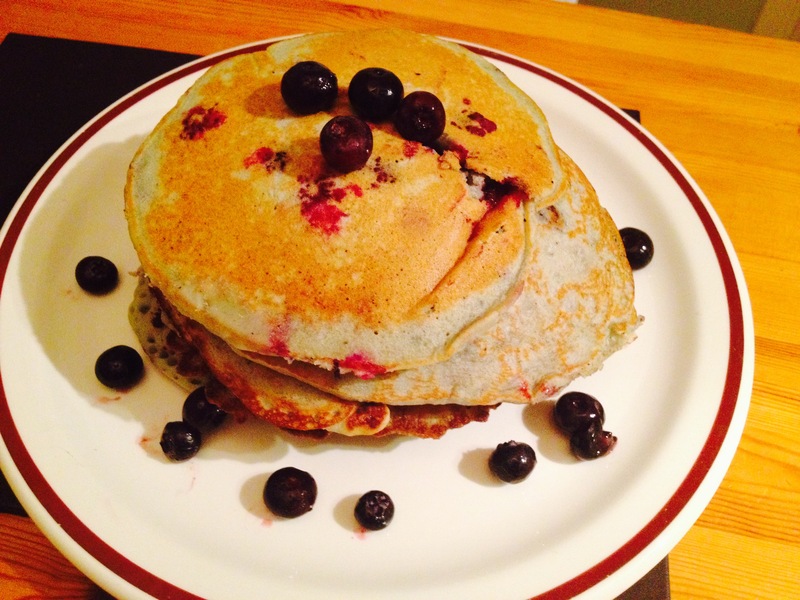 This Pancake Day impress your gluten-intolerant friends, family and dogs with these terrific American-style gluten-free blueberry pancakes! Easy and quick to make (I spent about 20 minutes on them in total), the ingredients are now thankfully available in most decent sized supermarkets. 1 – Mix the flour, sugar, linseeds, baking powder, cinnamon and salt together and set aside. 2 – In a different bowl, whisk together the milk, egg, oil and vanilla. 3 – Now whisk flour mixture into egg mixture just until combined. 4 – Fold in blueberries. 5 – Lightly grease a large nonstick pan over a medium heat. 6 – Use a ladle to spoon a small amount onto the pan, leave for a couple of minutes until it starts to brown, then flip and repeat with the other side. 8 – Stack and drizzle with maple syrup. Enjoy!